I decided to follow up on an excellent article in Techcrunch by Estonian software entrepreneur Sten Tamkivi. He has now lived for 10% of his life in Silicon Valley. But a few months ago he gave a short talk at Slush, a great tech-startup event in Helsinki that targets young companies from Northern Europe and Russia. Sten highlighted the growing communications problem between the West Coast of Europe and the US West Coast. It's the bottom of the priorities for many VC's in Silicon Valley. "Europe is for visiting with friends and family - but what a complex place to do business". He takes the arguments a lot further in a series of three blog posts which are highly recommended reading. Sten draws several important conclusions. I've cherry-picked from the main points, especially from the third post, because I believe the message isn't getting through to both start-ups and investors in Europe. And it desperately needs to do so, especially in countries whose mother tongue is NOT English. Many of these countries, (and I would include the Netherlands in this) start believing their own hype. Their domestic market is big enough to test out an idea (The Netherlands is a test lab of 17 million people), but far too small to ever succeed as a global brand. Here are a selection of Sten's conclusions. Sten continues: the key to the solution is on the European side. And to succeed in driving this change in relationships, Europe needs a mindset shift. When building high-value ties in any network the question should never be what you get, but rather what can you can give to the other party. What can you help with, what can you teach, what can you spare. This tends to be true with your friends, your community, your country… and I would suggest also when you think about doing business with Silicon Valley. Too often startups from around the world and among them from Europe go to Silicon Valley only to get something. Unfortunately, as it usually goes, a begging little brother will be treated as one. Silicon Valley’s weakest spot today is the constantly unsatisfied demand for talent capable of solving hard problems. Yes, there are amazing, experienced people around – but if they want to live anywhere fancier than a tent in Mission or Palo Alto, let alone afford good schools for their kids — they will cost a lot to hire. And worse, despite of their high price the endless inflow of exciting ventures to join drives down average tenure and loyalty in the Valley, compared to how these same people would behave in similar companies even on the East Coast, let alone in Europe. European contribution here on the West Coast has been largely the simplest: sending talented immigrants to US. The next in level of complexity, but more sustainable for both sides would be setting up more development outposts across the pond, helping Valley firms build offices and hire people in Dublin, Prague or Kiev. Or alternatively, Europe could offer more well-functioning M&A targets. Meg Whitman used to call this “off-balance sheet R&D,” when she was acquiring auction sites for eBay from around the world, especially those doing something better already than their new mothership. In this model jobs do remain in Europe, but not the large exits or even annual dividends. As a more far-fetched idea, why couldn’t we make this a two-way street and provide interesting “job adventures” in Europe for early-career Valley experts. There could be some who would drop their product management, product marketer or business development roles as the #3481 guy in Facebook to a 3-year stint in a cool European city where they can be #1 in the entire country in what they do. And once they go back – they can sell their new-found international experience as a truly unique skill. Yes, this is a tough sell at first, but we did that repeatedly at Skype and companies like Soundcloud are doing this again. Helsinki. Doing amazing things with data centres in the rock underneath the Finnish capital. The underlying point is that when it comes to online and mobile applications truly embedded in how people go about their daily chores, how they sign and exchange legal documents, how they interact with the government, how they do their consumer banking, how they get service from their doctors and so forth, many places in Europe are lightyears ahead of what is available to a normal American resident today. This is a huge opportunity to openly share the experiences and teach what we’ve learned in Europe to the waves of startups (and why not the various levels of US government, looking just at the IT-side of ongoing healthcare reform) attempting to only start solving similar issues for the people in their markets. Valuable, “been there done that” advice could take the form of board seats or equity stakes for Europe, too. Europe still is the rational next market for most US rocket ships who are looking to find customers with above-average income and access to credit cards who live in understandable regulatory environments and enjoy reliable infrastructure you can deliver your products and services over. Yet, as the truly single market of European Union is still a slowly evolving dream, figuring the operations out on a country-by-country basis to cover the full 400M user potential can be tricky. And who else to help US entrepreneurs to crack Europe than those who are in Europe and understand Europe. Again, we have something to selflessly teach here. In the post-Snowden days we’re living in the questions about physical and legal location of users’ data and the regulations governing their privacy are high on the agenda for internet entrepreneurs. Since the internet was born in the US and the strongest private players on it have been US-regulated companies the rules and behaviours have been evolving accordingly to date. Now, if you look at where the users of internet live today, less than 10% of them are Americans — a share still on decline. It is obvious that other nations will attempt to have an increasing say in the governance mechanisms and regulation of the system. The good news we should spread here in Silicon Valley, at any opportunity we get, is that European tech scene is much more diverse than others realize. There are pockets of startup activity with global ambition in hundreds of cities around Europe, and dozens of them are likely to realize some of that potential on global scale. 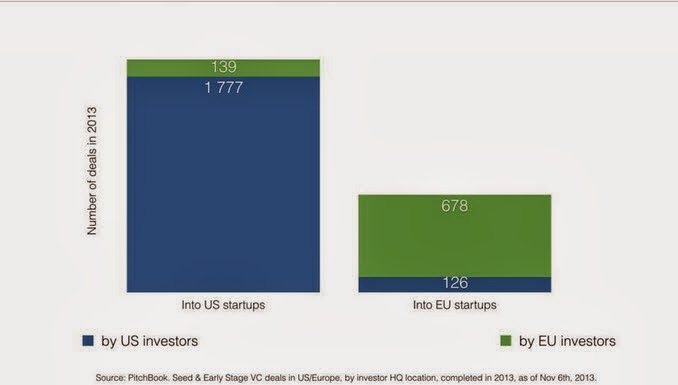 Single Europe is a much more beneficial concept for everyone, including Silicon Valley. Here, here. But it really is time for a call to action. Not another meeting or conference about it. That's also very European!